CATraining and Project Merlot head together into 2009. CATraining Ltd have pledged to continue their support of Project Merlot into 2009. Chris Gage, a director of CATtraining, said "Even in these tough economic times it is important not to lose sight of what Project Merlot stands for - giving people the opportunity to develop a skill which they would not otherwise have the chance to try. It is only through the far sightedness of the members of Team Merlot - Martin, Jon, Robbie that his can happen and we are proud to support them for another year"
Brands Hatch and its still wet! 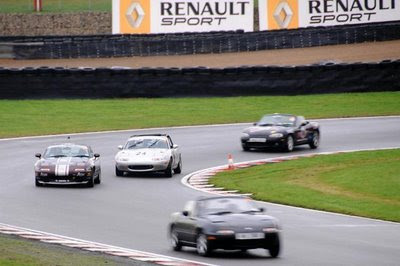 I guess it’s the time of year, it could even have snowed but in the end it was just a damp track that awaited Project Merlot on its first track day at Brands Hatch. On a day organised by MazdaOnTrack and featuring, yes you guessed it, lots of other Mazdas, Martin, Jon and new Merlot driver Ady Neill took the Merlot out on its last event of 2008. The wet track at Rockingham in October had been extra slippery but the wet track at Brands was only regular slippery and by the afternoon sessions a dry driving line was to be found. Ady Neill was fulfilling a long held dream to drive on the Brands Hatch track and Team Merlot were glad to help out, especially as Ady had spent many hours applying the cars graphics over the last couple of years and only ever managed a couple of sprint laps at Haynes before today!